With the economy on hold, there are lots of good (and some bad) construction projects currently frozen mid-construction, leaving a glaring rip in the urban fabric. As Woods Bagot New York Principal Jeffrey Holmes traveled to work every day, he contemplated these voids and wondered what could be done to make them more attractive and useful until developers resumed their projects. What he came up with is an urban 'Iceberg' made of recycled and recyclable materials that could be easily installed and would serve as a temporary and flexible space for any number of uses. The ‘Icebergs’, as seen at Bustler, are designed to be versatile spaces with minimal infrastructure and construction requirements, serving as architectural placeholders rather than real buildings. Woods Bagot envisions the temporary installations that look high quality and could attract top-notch vendors while encouraging developers to start working again. The unique spaces could support a wide range of uses, like pop-up retail shops, exhibitions, cultural events, or even temporary spaces for non-profit start-ups. A special lighting system could project images and brand logos up on the peaks of the icebergs to advertise the space. Woods Bagot conceived the space as a completely sustainable installation with “cradle to cradle” qualities — it’s made entirely from recycled, recyclable and reusable materials. The structure would be composed of a modular and reusable steel frame, which is wrapped in translucent polycarbonate panels at the ground level, then topped with a tent of super-lightweight ETFE. Design for the Icebergs also include the use of solar hot water and natural and active ventilation systems for both heating and cooling. Lightweight and modular, the Iceberg could easily be transported, assembled in a matter of days, and then at the end of its life disassembled and moved. Seems like a great concept, but what are the costs involved for placing and activating/running an iceberg vs. the cost of merley leaving the sites covered in the usual manner? 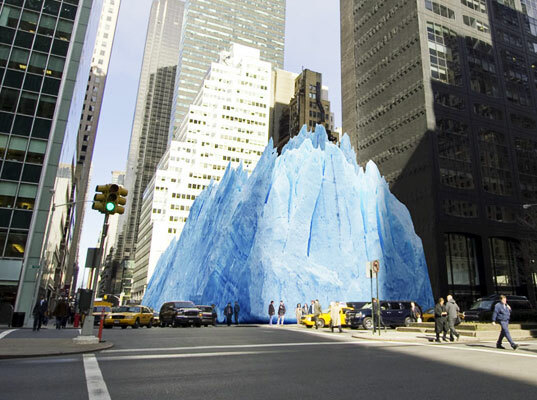 I love looking at those urban icebergs! Woods Bagot has designed a sustainable building system that could revitalize stalled construction sites with 100% recyclable, inflatable and flexible spaces called ‘Icebergs’. The Iceberg is a modular and lightweight system that can be easily transported and erected at any empty lot or construction site. The space could then be utilized for a variety of programs and events while construction is on hold. The space could be utilized for interactive pop-up retail shops, exhibitions or cultural events, or even office space for local start-ups and non-profits. Branding on the iceberg would be easily achieved with projection systems from the inside. Woods Bagot New York Principal Jeffrey Holmes, who came up with the idea said, "Owners and developers are spending money every day to cover these idle sites, and people are hesitant to build on them in the meantime. We wanted to make something high quality with a real presence to attract top-notch venues." The icebergs were envisioned as a completely sustainable temporary space made from recycled and recyclable materials. They would also feature highly energy-efficient building systems. Here a rendering of the interior shows how interactive the space can be and how images could be projected on the walls of the ETFE tents. 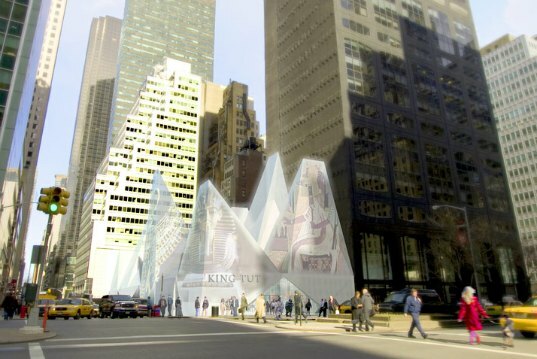 Constructed of modular steel tubing, polycarbonate panels and ETFE tents, the Iceberg would also feature a projection lighting system and a solar hot water heater, which helps heat the building. In the winter, solar hot water and fans are used to move hot air around the tent and eliminate freezing. In the summer, the hot sun reflects off the tent facade and the fan helps move hot air up and out of vents. Transportation is very simple -- everything can be loaded in a truck, hauled to the site, and assembled in a matter of days. At the conclusion of the installation, the iceberg is disassembled, repacked into the truck and hauled to the next stalled construction site. The temporary installation is meant to utilize the vacant space that would benefit the city while encouraging developers to restart their projects.